Get your tissues ready, because this might just bring you to tears. U.S. Army soldier Austin Arledge decided to give his mom the surprise of her life when he returned home a month early from a deployment in Afghanistan. Arledge hid in the flower bushes outside of his house in Franklinville, New Jersey. At the same time, a friend went inside to convince his mother to come outside right away. When she spots her son, the look of shock on her face is priceless. She screams “Oh my god, oh my god!” before embracing her son and crying of joy. “How did you do that? Where did you come from?” she asks before kissing him on the cheek. See this touching moment for yourself in the video below and pass it on. For more classic homecoming moments, watch this soldier surprise his mother on her birthday after two years apart, see this soldier surprise his mom at work and check out this soldier surprise his dad during a meeting. Anyone got a box of tissues? Previous articleCan Potatoes Really Cause Cancer? 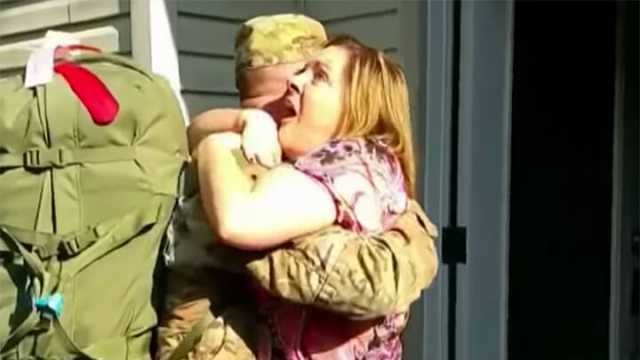 Hey Buddy!, I found this information for you: "Soldier Returns Home From War To Surprise Mom". Here is the website link: https://www.thealternativedaily.com/soldier-returns-home-war-surprise-mom/. Thank you.